You must have been a resident of North Dakota for six (6) months immediately before filing for divorce. If you have not been a resident for this time period, the divorce cannot be finalized until you have been a resident for six (6) full months immediately before the entry of the Decree of Divorce. North Dakota is a no-fault divorce state. In a no-fault divorce the spouses agree that irreconcilable differences caused the breakdown of the marriage. You review and sign the initial divorce documents, then file them with the court clerk. You serve you spouse and provide your spouse with the divorce documents he/she needs to complete. You then file the remaining documents with the court clerk. Once the judge signs the Findings of Fact, Conclusions of Law, and Order for Judgment, the court will mail a copy of the Judgment to both parties. A court hearing is not required unless the judge decides one is necessary or if minor children are involved. If you select a North Dakota divorce with children, you are selecting the non-children forms as well as a Parenting Plan, Financial Affidavits, Notice of Hearing and Appearance and Child Support Worksheet(s). 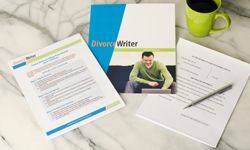 DivorceWriter provides forms specific to the state of North Dakota and offers a money back guarantee if your documents are not accepted by the Court. You have qualified to use DivorceWriter to complete your North Dakota divorce papers online. Select "Continue" to start the interview.